The Request: The client requested a large-scale installation that would encompass the entire 3,000 square foot ballroom ceiling. This feature was meant to convey a modern, continental ballroom with hanging crystals, sparkle points of light, filigree panels, and metal grillwork. They also requested that the piece integrate with the millwork. Curved structural soffits crossed through the space, and merge seamlessly with the curves of the fixture. The overall effect was to be a large-scale piece of art suspended from the ceiling. Design Challenges: iWorks determined that the success of the project was dependent upon the fixture being modular in design and easily serviceable. Given that there are hundreds of light sources throughout the piece, it would be very difficult for the property to maintain the fixture with standard lamping. The fixture needed to be modular for the purposes of production, shipping and installation. The Solutions: iWorks selected fiber optics and LEDs for the lamping in the fixture, due to their ease of maintenance. Fibers light each panel and are then bundled and routed to a strategic location in the soffitt for maintenance. LED down lights were utilized to highlight the thousands of tiered crystals on the outer perimeter. LEDs require much less maintenance than standard incandescent lamps, as they have an extended lamp life. Should the LEDs need to be maintained, they are located along the outer edge, where they are easily accessible. 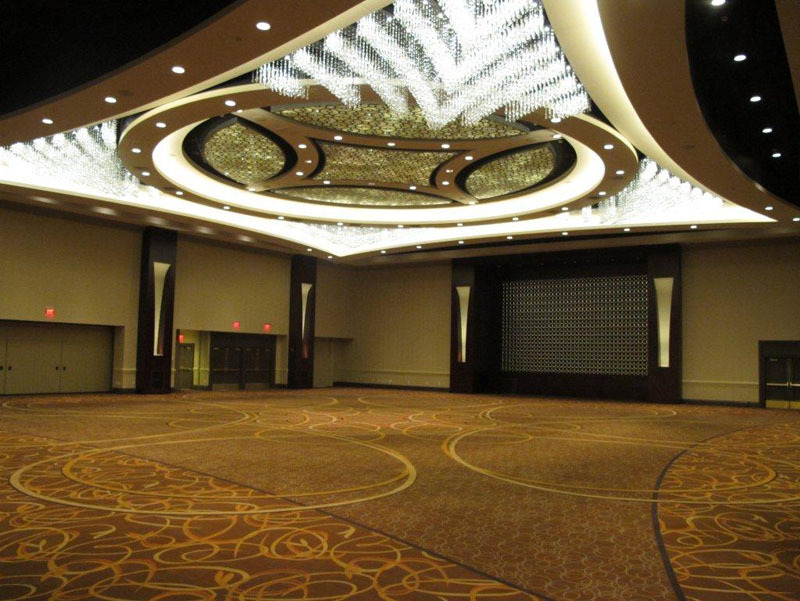 You Have to Know: It took five, 53-foot trucks to ship this ballroom fixture. An iWorks technician assisted local electricians in the installation. The fixture was to intergrate with architectural millwork. Panels with fiber optic strands were installed to cover the 3,000sf area. The outer perimeter is made up of ‘chevron’ ceiling pans, with LED lights and crystal strands. The center panels utilized fiber optic pinpoints of light for their ease of maintenance. The outer perimeter utilized LED downlights for their long lamp life.